The NHS in England may suffer its worst winter in recent history if it does not receive an emergency bailout, hospital chiefs are warning. They say the cash is needed to pay for extra staff and beds because attempts to improve finances have failed. The government has given councils an extra £1bn for social care services to help relieve the pressure on hospitals. A Department of Health spokeswoman said: "The NHS has prepared for winter more this year than ever before." But the latest figures show A&E waits and bed shortages remain "stubbornly" bad, according to NHS Providers. The group, which represents NHS chief executives, is calling for between £200m and £350m to be made available immediately. The target to see most patients in A&E within four hours has been missed for two years now, while bed occupancy rates remain above recommended levels. 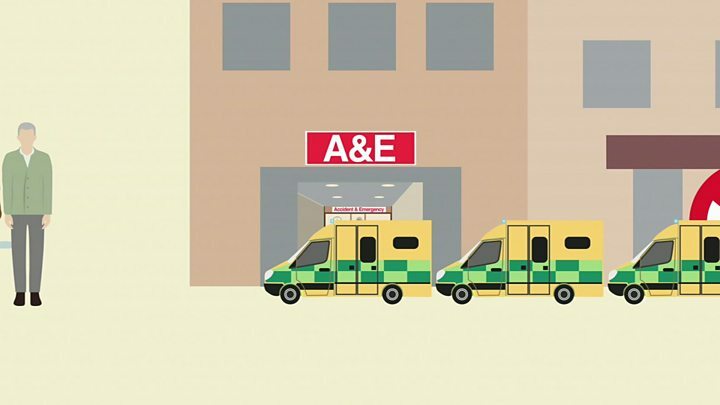 Over the summer, just over 90% of A&E patients were treated or admitted within four hours. That was below the goal of 95% and was almost exactly the same percentage as last summer, which was then followed by the worst set of winter waiting times since the target was introduced in 2004. Chris Hopson, chief executive of NHS Providers, said: "Last winter the health service came under pressure as never before. This winter could be worse." He acknowledged that planning had been much better this year but said that despite those efforts, and the extra money for care services, hospitals were still struggling to improve performance. "We are in virtually the same position as this time last year," he said. "Unless we get extra money, patients will be put at greater risk as local trusts won't have the beds and staff they need to meet the extra demand we will face." Mr Hopson said feedback from his members showed that delays in discharging patients, and workforce shortages, were hampering their efforts. He pointed out that the NHS budget had increased by only 1.3% this year compared to a 5% rise in demand. 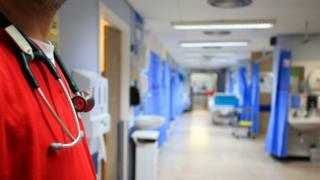 NHS bosses had already made savings of £20bn in the last Parliament and international evidence suggested the English health service was one of the most efficient in the world, Mr Hopson said. But he said the Office of Budget Responsibility had estimated that the NHS would still have a £15bn funding shortfall by 2020. Mr Hopson said: "There's a bit of a myth running around that somehow if the NHS could be that bit more efficient or a lot more productive we wouldn't need to put this extra money in. "Of course we should find more productivity and efficiency, but it's not going to close anything like that size of gap." The call for more money comes ahead of a meeting of NHS leaders and Prime Minister Theresa May, which is expected to take place next week. It is understood Mrs May has called in bosses at NHS England, and the regulator NHS Improvement, to check on plans for this winter. Colchester Hospital University chief executive Nick Hulme said the past few months had been "as challenging as any I can remember - there has been no let-up". "Our major concern going into this winter is staff - we are 50 junior doctors short on our rotas across the hospital. Every day is a constant struggle." John Lawlor, chief executive of Northumberland, Tyne and Wear NHS Trust, which runs mental health services, said: "Pressures on staffing, especially in psychiatry, are beginning to impact on services." The government however, maintained that the £1bn extra for social care, coupled with a £100m fund set aside to get GPs into A&E departments to help see patients, would have an impact. But Dr Tony O'Sullivan, the co-chairman of the campaign group Keep Our NHS Public, told the BBC this was an "emergency response to a situation that has been created over several years". He accused the government of "deliberately underfunding" the health service. Meanwhile, Pauline Philip, NHS England national director for urgent and emergency care, said she had already received feedback from hospitals that more than 3,000 new beds would be opened in the coming months, which would help alongside the measures being taken nationally. She said: "The NHS will face challenges this winter, as it does every year. "But as NHS Providers has stated, winter planning is more advanced than it was last year and, as they argue, special attention is being paid to areas where pressures are likely to be greatest. "We are currently in the process of assessing how many extra beds trusts are planning to open over winter and early returns indicate that this will be more than 3,000. "This is something we will continue to review on the basis of evidence rather than arbitrary estimates. "If the expectations for reduced delays transfers of care outlined by the government are achieved, this would free up a further 2,000-3,000 beds over the winter period, on top of the extra 3,000 plus beds that hospitals now say they're going to open."